Megatron. Mega Drive. Such a simple concept, how come it has taken 25 years to get these two together? This limited edition figure, by Takara Tomy, will be shown at today's Winter Wonder Festival in Japan. The biannual convention showcases the latest in toys, action figures, figurines and the like. Sega itself heralded the coming of Mega Drive Megatron onits Twitter account yesterday. 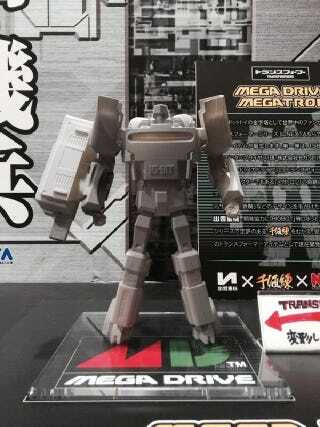 "Mega Drive is transformed into Megatron!" reads the translated Tweet. Here's a shot of Megatron/Drive at the booth. It is a smaller and, of course, not a functioning console—though it does appear (from the image Sega tweeted, and the one in the booth) that Megatron's right hand is some sort of a USB device. No word yet on its availability, Western or otherwise.